Here in Vancouver, last week, we had a few, brief, glorious, warm, summer-like days. And then it started raining again. 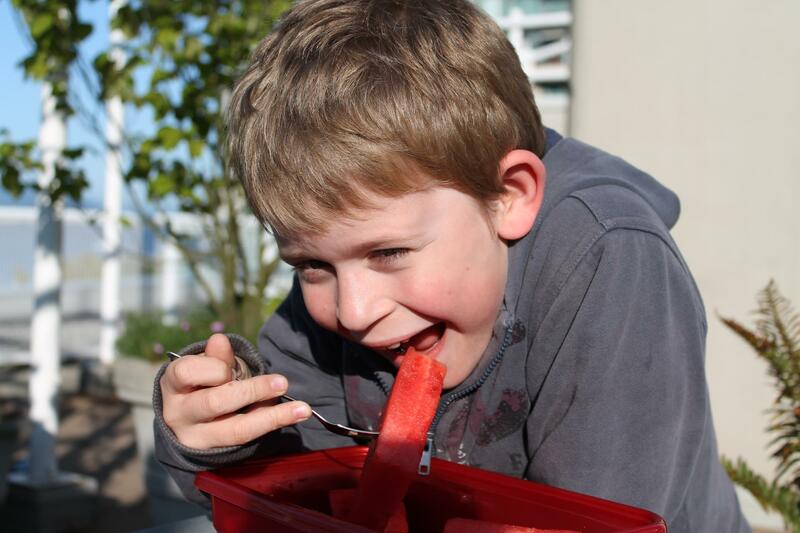 Nothing says “summer” to me more than watermelon. Refreshing, juicy and sweet, it’s the perfect summertime food. And probably my favorite cocktail of summer is the mojito. Also incredibly refreshing, with hits of lime and mint, cool and sparkling. I was buying groceries last week, and big watermelons were on sale for $5. I couldn’t resist. Michael and I chowed down on about half of it, but I had lots left over, and a dinner invite for Sunday night. 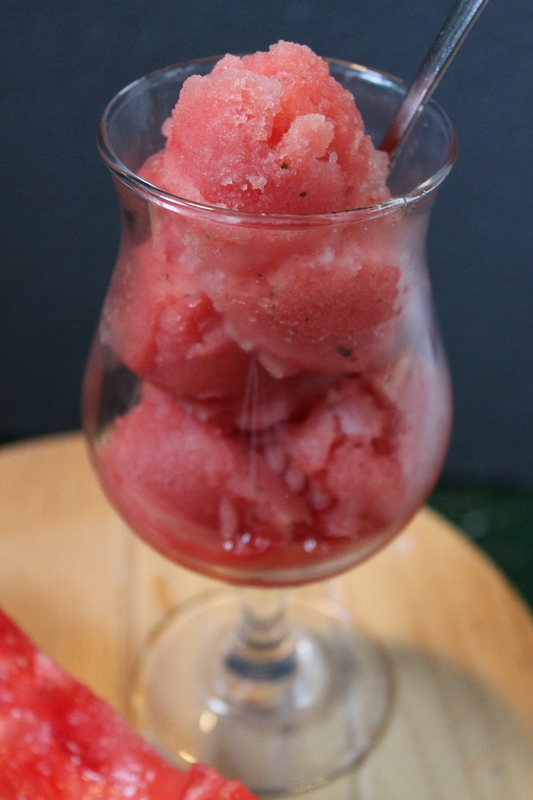 I decided to make a Watermelon Sorbet. But not just any sorbet: a Mojito sorbet. Now, I made this in my ice-cream maker, but if you don’t own one, try making it as a granita. I’m confident you could add rum or vodka to this to make it an “adult” version, but I didn’t, as I was concerned about how the alcohol would affect the freezing process. And I also wanted to feed it to my 8-year-old. Bang the watermelon into a blender and turn it on. Drizzle the simple syrup into the top hole of the blender as it’s running. Puree until everything is smooth, then add the lime juice and a pinch of salt. Next, you get to decide how Mojito-y you want your sorbet to be. If you want it to be flecked with bits of lime rind and mint, then stop blending, and stir the mint and lime zest in by hand. If you want it to be a more smooth, consistent texture, then add the lime zest and mint to the blender and give it another whiz. Now, get out your ice cream maker and set it up. Turn it on, and while it’s running, pour the watermelon mixture into the top. Freeze according to manufacture’s directions.